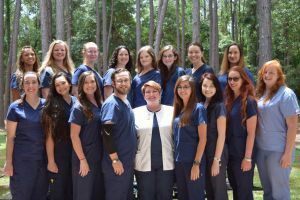 Sixteen students graduated from the Pensacola State College’s Veterinary Technical Program in May. They are, front row, from left, Mary MacClure, Christina Kreger, Hayley Kurpil, Ben Holsworth, Vet Tech Program Director Sarah Meyer-Paterson, Blythe Burgman, Christina Dunham, Tiffany Padgett, Sara Robertson. On the back row, from left, are Jasmine Gann, Savannah Burrell, Jenni Palencia, Ashley Lail, Morgan Smith, Molly Blake, Amy Golding, Kristin Tourney. The two-year Vet Tech Program covers a wide range of skills including animal behavior and husbandry, clinical procedures, anesthesia, lab diagnostics, medical and surgical nursing, radiology, dentistry, and office management.